Anglicanism covers a pretty broad range of Christian perspective and tradition, and yet, its various ‘parties’ or ‘streams’ or ‘flavours’ are similarly broad in their definitions. In particular, I’ve spent a great deal of time pondering what Anglo-Catholicism actually is. There seem to be several definitions out there, depending upon which Anglo-Catholic you ask. Most of them overlap a great deal, which can help identify the common core definition, but one can’t discount the wideness of the spectrum even in this small corner of Christianity. Compared to Protestant Christianity, all of Anglicanism is highly liturgical, but within Anglicanism there is quite a range – some Anglicans downplay the liturgical emphasis to the point where they resemble typical modern Evangelical churches. 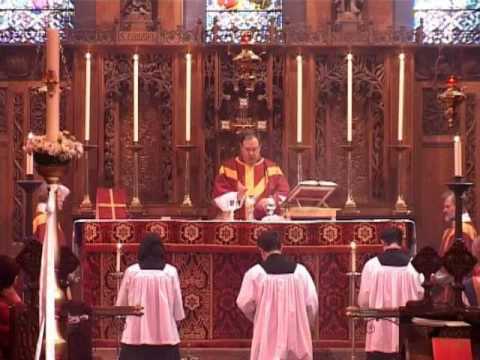 Anglo-Catholics, however, are the Anglicans who play up the liturgy in worship. In particular, there are people who specifically call themselves Anglo-Catholics because they like, prefer, or require fancier liturgical forms. One way to illustrate the difference, briefly, is to look at the vestments wore by the ministers during the Eucharist service. Here is the Archbishop of Canterbury in fairly basic vestments (alb & stole). Contrast that to the next picture where a priest is dressed in a chasuble, the altar is fancied up a lot more, the background of the church is beautiful, and there are more ministers assisting around the altar (albeit kneeling out of the way at the moment of the photograph). In this reckoning of Anglo-Catholicism, it’s not so much a theological position as it is of practice. It’s really a type of spirituality that makes heavy use of ritual and visual and tactile expressions of faith. This is not a bad thing in itself, though it does receive a bad reputation sometimes because many liberal Anglicans (liberal to the point of non-christianity) are often into high church liturgy and thus call themselves Anglo-Catholic. The issues of that liberal subset aside, the Anglo-Catholic spirituality is a legitimate expression of Christianity. Overall, the general attitude is that “more is better” because worship is about honoring God, so minimizing worship is like telling God we don’t care about him all that much, while fancying things up as much as possible expresses our devotion and allegiance to him. Anglicanism is broad not only in liturgy, but in theological perspectives too. Although our tradition is rooted around the same core orthodoxy as historic Christianity, the details that orbit that core are not defined dogmatically, allowing for a healthy diversity. It is in that context where Anglo-Catholicism comes in as the particularly Catholic (and less reformed/protestant) theological perspective. This is part of #2 above, but there are people who think this doctrinal position alone is enough to qualify them as Anglo-Catholic, so I’m treating it as a third option. Anglicanism has a difficult identity to describe and define; some emphasize the continuity with the pre-reformation Church, others emphasize the reformation’s more protestant leanings. Thus, Anglicanism has apostolic succession (despite what the Roman Catholic Church argues) but does not necessary declare it to be a required component of the Church’s ministry and authority. Low-church Anglicans affirm its value but deny its necessity. Anglo-Catholics, on the other hand, argue for its necessity. As such, many Anglo-Catholics believe in the Branch Theory, or something similar to it, wherein the Roman Catholic and Eastern Orthodox and Anglican churches are considered the three main branches of Christianity that have resulted from the various schisms through history. These branches are defined by the historic succession of bishops, and thus this category of Anglo-Catholic is particularly critical of Protestantism, on account of its lack of historically-linked bishops. Those are the three big definitions of Anglo-Catholicism that I’ve seen thus far. A number of smaller definitions run along with them, such as favorite prayer books (1549 and 1928 most often), frequent reference to the undivided Church of the first millennium, a preference to cite seven ecumenical councils instead of the first four, and stuff like that. Anglo-Orthodoxy, similarly, is much like Anglo-Catholicism, except for a few Eastern preferences over Western, such as downplaying the doctrine of original sin in favor of ancestral sin or original corruption, and preferring Eastern-style icons to Western-style art and statuary. In an attempt to carry out some self-assessment, it’s clear that I fit into the third definition of Anglo-Catholic, as I’ve espoused my position before on this blog. How much that carries me into the second category, though, is not clear to me. I’m very unsettled on a number of theological minutiae that divides catholic and reformed positions, still drawing from both the Evangelical and the Catholic streams of Christianity. As for the Anglo-Catholic spirituality, there are aspects of it that I enjoy and connect with, but others that I don’t so much. For example, I do love liturgical worship and appreciate (and maybe even need) the order and form it provides, but I’m not necessarily feeling the need to a specific set of forms. 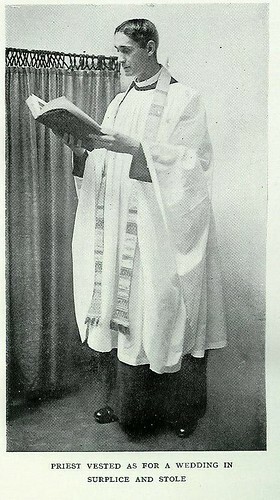 I appreciate when the ministers wear worship vestments, and I prefer to do so myself when I’m assisting in that ministry, but I don’t necessarily feel the need to go all out with the alb, stole, and chasuble for Eucharistic celebrations – I like the low-church Anglican look of cassock, surplice, and stole just fine too (as this picture here shows). But hey, I’m still young, and not a clergyman yet, so there are plenty of opportunities ahead for me to experience more ministry, try out different styles, discover my style and preferences, sort out my theological positions, and grow in my identity as a Christian and an Anglican and a Pastor. This entry was posted in Uncategorized and tagged ecclesiology. Bookmark the permalink.